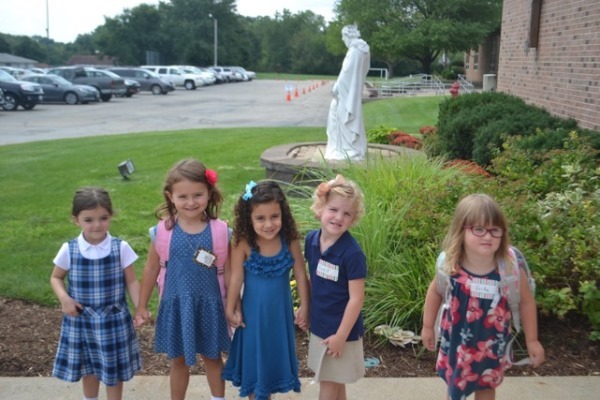 St. Vincent de Paul Preschool welcomes 3, 4 and 5 year olds to our program! While recognizing you as a Catholic Parent to be the most vital influence in your child's growth and development, we offer a variety of activities to nurture the spiritual, emotional, intellectual, physical and social development of your child. Our program is designed to prepare children to make the transition from home, to school, to Kindergarten. 8:30 -11:00 a.m. or 8:30 a.m. – 3:00 p.m.
*Parish Members only - 5 Day 8:30 a.m. - 3:00 p.m.
8:30-11:00 a.m. or 12:30-3:00 p.m. or 8:30 a.m. – 3:00 p.m.
St. Vincent de Paul Preschool registration will take place on a Sunday, mid-February after the 9:00 AM Mass at the preschool. Openings for the three year-olds and Pre-K classes will be available. Open slots will be filled according to the admission policy outlined in the St. Vincent de Paul Preschool Handbook. In addition to the class time, St. Vincent de Paul School offers before and after care for preschoolers. The pre-school registration fee of $50.00/child is due at the time of registration and is non-refundable. If you have questions, please call Kathy Barnett, Preschool Administrator, at 691-5012 ext. 105.